Another of my posts mostly about news that came out after I queued up the Friday Links. Thursday before last was the first day of legal recreational marijuana sales in Oregon. The big news out of Oregon that day should have been about the triumph of de-criminalization over the myths of the war on drugs, et cetera. Instead we had a mass shooting at Umpqua Community College. Despite that, legal marijuana did move forward, and in a really big way: Oregon’s first week of recreational pot sales tops $11 million. The Upmqua Community College shooting was the 32nd mass murder (using the FBI’s definition) in the United States of 2015. Lots of news organizations were reporting that it was the 32nd mass shooting, but the FBI doesn’t have a definition for mass shooting, only for mass murder, which is when four or more people are killed in a single incident. But the media keeps reporting these as mass shooting statistics, and I think that that affects how people perceive the problem, because by the FBI’s statistics, the Lafeyette theatre shooting in July, in which eleven people total were shot, but only two died, isn’t being counted in that statistic. A more reasonable statistic would be the define a mass shooting as any time 4 or more people were struck by a bullet in a single incident, regardless of how many of them survived. By that metric, The Umpqua Community College shooting was the the 295th mass shooting of the year. Read that again: 295 mass shootings for far this year in the U.S. as of October 1—that’s more than one a day. That’s more mass shootings in a year than other countries have in decades. Heck, that’s more mass shootings a day in the U.S. than most countries experience in a decade! Yet, some people keep insisting that these things can’t be prevented. They are right only in the sense that as long as we let them use that nonsense argument to prevent us from doing anything about it we won’t reduce the number of shootings. It shouldn’t have surprised us that on Friday morning there was news of yet another school shooting: Arizona Campus Shooting Came After Fight Between Two Groups of Students. Four people shot, only one of whom died. So it won’t be counted as a mass murder, but it certainly was a mass shooting. And we shouldn’t be surprised at this revelation: SHOCKER: The Northern Arizona University Shooter Is a Patriot and a Gun Nut. As if one school shooting on Friday wasn’t enough, we had two! TWO IN CUSTODY IN FATAL TEXAS SOUTHERN UNIVERSITY SHOOTING. Since I made a big deal in the earlier paragraphs about definitions, it would be misleading of me to refer to the Texas Southern shooting as a mass shooting: only two people were shot, of which only one died. However, the Texas Southern shooting is worth mentioning because it was the third shooting on that campus within the space of a week! There are been another incident on Tuesday night, and they mention just casually an incident the previous weekend where someone fired two shots but didn’t hit anyone. But Congress doesn’t have time to close any loopholes in existing gun laws (such as a fact that it is not a federal crime to knowingly purchase a gun on behalf of someone who is legally barred from owning a gun!). 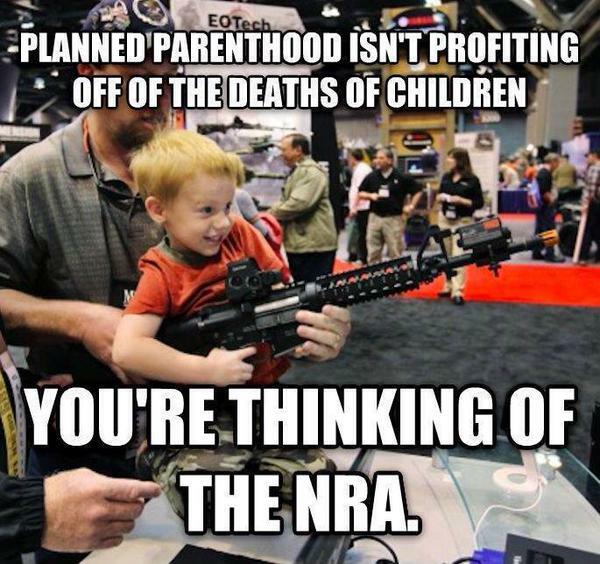 They’re too busy conducting a witchhunt against Planned Parenthood and coming up with nothing. Republicans Admit Planned Parenthood Did Nothing Wrong. Fortunately, not all of the news late on Friday was bad: We Were Sued by a Billionaire Political Donor. We Won. Here’s What Happened. Billionaire donates millions to anti-gay causes, a magazine reports the fact, and he sues them for defamation. This is a variant of a problem we deal with with these rightwing nut jobs all the time: if you don’t want to be called a bigot, stop doing bigoted things! Especially when you’re a co-finance chairman of not one, but two presidential campaigns (which means you are no longer considered under the law a private citizen, you’re now a public figure) who buys dozens of billboards to put up anti-gay messages, purchased full-page ads in major newspapers to run anti-gay slogans, go on Fox News to describe how awful it is to institute anti-bullying campaigns that try to protect gay children from harassment and bullying, et cetera. On a much more pleasant topic, tomorrow is National Coming Out Day: What You Need to Know: National Coming Out Day 2015. Coming out is scary. It doesn’t always go well. I’ve written before about some of the issues I’ve had (and sometimes continue to have) with family members and old friends. But I firmly believe that, unless you are a kid living at home or otherwise still dependent on your parents for financial support, or unless you live in a place where it is illegal to admit to being queer, coming out is better than continuing to live the lie. There will be some surprises when you come out. Some people that you are certain will never come around, will become your biggest defenders. Some people who you thought might understand will disown you and go to their grave without reaching out. You will definitely learn which people really love you, and which only love the idea of who they think you ought to be. But living the lie carries a heavy price, because you live in constant fear of being found out, and you expend a lot more energy than you realize trying to cover things up all the time. Second-guessing yourself, keeping track of cover stories you’ve told, the constant worry damages both your mental and physical health. And all of that goes away once you stop hiding in the closet. Once you’re free of that you’ll be able to fill your life with people who really love and respect the real you for who you are. And that is a much happier and healthier way to live!